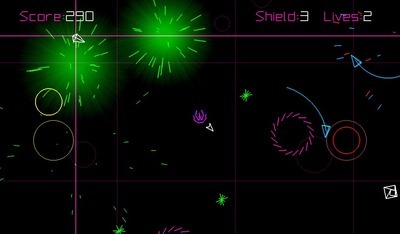 PewPew is Asteroids on steroids. It blends the best of old and new. Despite its old school looks PewPews gameplay would get any gamer hooked. This is a great game for tablet or smart phone gamers. When I started gaming, the best console available was the Atari 2600 and the first game I played on it was Asteroids. PewPew has that same Atari 2600 feel but the game is so fast paced that the old Atari system would never be able to handle it. 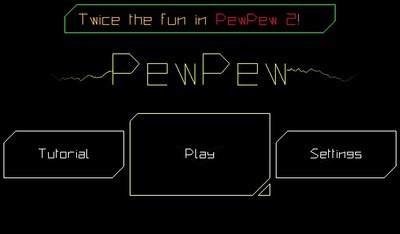 PewPew is a space shooter with three game modes. Players control a spaceship with two virtual thumb pads. The left pad controls ship movements and the right controls the direction of the ship’s weapon. That’s basically it. All you need to do is survive as long as possible. Players need to use a different strategies depending on which game mode they are playing. The Pandemonium mode is a free-for-all, where players have to survive a constant onslaught of enemy shapes and ships. 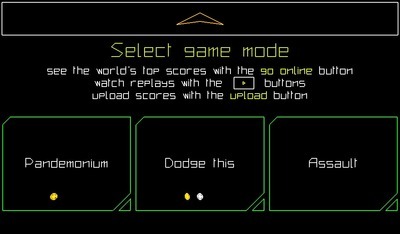 ‘Dodge this’ is the second game mode in PewPew. 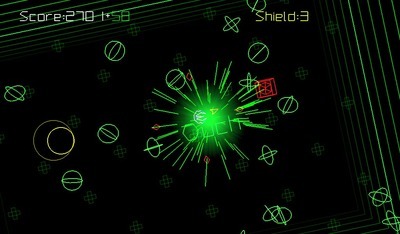 This mode has two objectives: grab as many red boxes as you can and dodge all the green circles for as long you can. The longer a players lasts, the more green circles appear on the screen. The final mode is called Assault, and it’s exactly what it sounds like. Players are attacked by row after row and column after column of enemy shapes; they must survive as long as possible. In all three modes, players can gain extra shields while they play to help them live longer. 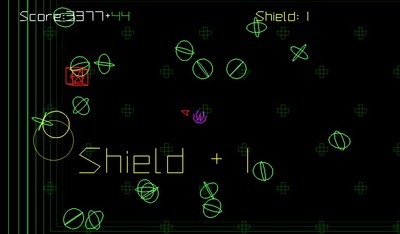 Each shield allows for one extra hit on the ship before it explodes. There are two ship upgrades in PewPew and players must be adept at all three game modes to unlock them. Each game mode has three medals: Bronze, silver and gold. To unlock the first ship, a player must have two bronze medals and one silver. The second ship is much harder, requiring three bronze, two silver and a gold medal. PewPew is a great space shooter for all ages, and best of all, it’s free on all devices.